I have recently finished my undergraduate degree in Zoology at Anglia Ruskin University, Cambridge. I was given the opportunity to go out to Borneo with the University for a Field Course that is run for masters students studying relevant post-graduate courses. The trip would see me spend 10 days in Sabah with the rest of the group and another 7 days with a handful of other students who were staying in the country for independent travel. My original plan was to stay in Borneo all summer as carry out some research that would form the basis of my masters, but due to a recent change in the law regarding permits I was not able to secure the appropriate permit in time. As a herpetologist I was interested in finding as many exotic reptile and amphibian species as possible, especially when I’m used to the UK’s impoverished selection. My checklist of species I wanted to see whilst out there included such animals as the saltwater crocodile (Crocodylus porosus), the water monitor (Varanus salvator) and gliding lizards (Draco spp.). In reality I only managed to find water monitors which are in no short supply in Borneo. My dream checklist was mainly dominated by reptiles, despite the fact that back in the UK I mainly study amphibians; this is because I wanted to see the large, charismatic species that our lands lack. We flew out from Heathow airport on the 4th June and arrived in Borneo on the 5th. After a day to recover from the flights, I was particularly fond of this as I am 6 feet and 4 inches tall so being cramped in economy seats for the best part of a day wasn’t comfortable; we started to explore the local area. We visited the Gomantong Caves, where we saw the nests made by swiftlets (Aerodramus maxima) which are harvested for bird nest soup as well as some wild orang-utans (Pongo pygmaeus) which was a great experience. On our drive back, we stopped in a roadside restaurant to use the toilets (everyone had been drinking quite a bit to ensure they didn’t dehydrate) and this is when I was greeted by my first Bornean herp. This was the common house gecko (Hemidactylus frenatus) which is found in a large number of south-east Asian countries. It wasn’t how I expected to discover my first herp but, as most of you will know, things don’t always go as planned. Later that evening we went on a river cruise and saw proboscis monkeys (Nasalis larvatus), pig-tailed macaques (Macaca nemestrina) and long tailed macaques (Macaca fascicularis). It was whilst we were watching a troop of macaques from our boat that I spotted my first water monitor, lazing on the branch of a tree with its legs dangling. After we had seen a multitude of wading birds and more troops of macaques and families of proboscis monkeys we went back to shore for dinner. This wasn’t before the sun set and we managed to witness one of the most beautiful sunsets I have ever seen. On the 9th June, we visited Kota Kinabalu and attended the International Conference on Rainforest Ecology, Diversity and Conservation in Borneo. Here we sat through a number of eminent scientist’s talks although I couldn’t help but feel that a number of them went off topic. During the lunch break I caught up with Indraneil Das where we had a quick conversation about Borneo, frogs and other matters. 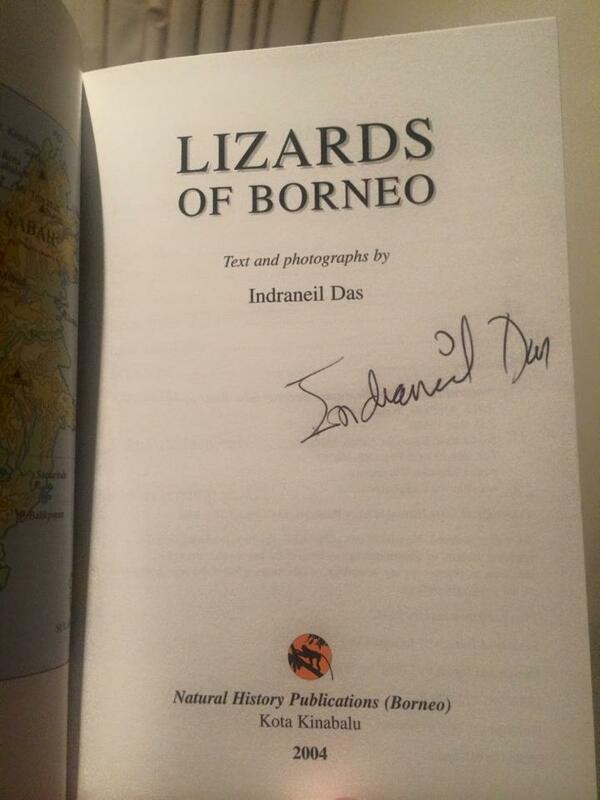 Before we parted ways, I asked him to sign a couple of books I had bought with me to Borneo in preparation of finding some herps in Borneo. He gladly obliged which made my day. Whilst staying in Kota Kinabalu, there was substantial rain on the night of the conference. One of the lecturers whom was with us came running up to my room and asked if I was free, he was worried that he may have woken me as it was 11pm and we had been up very early that morning. In fact, I was just sitting on my bed reading The Sixth Extinction: An Unnatural History by Elizabeth Kolbert. I quickly grabbed my torches and camera before following my lecturer down to the car park. The rain had filled some drains towards the back of the car park and we could hear calling which sounded like the low bellow a cow or deer coming from those drains. I used my torch to investigate and discovered about 15 or so male frogs inflated and calling on the surface of the water. These frogs were my first Bornean amphibians which turned out to be the banded bullfrog (Kaloula pulchra). Towards the end of the main trip, we spent a couple of days at the Maliau Basin Research Centre. As soon as we arrived, I noticed a large body of water near our accommodation. It may have been man-made but I certain it would contain a number of frogs. Sure enough, after dark I grabbed my torches and headed out to the pond. Upon reaching it I was blown away by the chorus of the frogs. Most notable and most numerous was that of the green paddy frog (Hylarana erythraea). They seemed to be everywhere but didn’t like being in the torchlight so it took me a while to get a photo of one. What was even more embarrassing was that some friends had spotted the first few frogs despite not having any survey experience, my paradigm and technique for spotting frogs clearly didn’t work in a tropical setting. After I got my eye in I was once again able to ‘see’ the frogs. After the main group had left to return to the UK, me and a handful of other students stayed behind in Borneo to visit a few more places and get a more tourist side of things to balance our view of the country out. We stayed at a lodge just outside of Sepilok, an area known for its rainforest and associated wildlife. It was on one day, whilst going round the Rainforest Discovery Centre (RDC) in Sepilok that I managed to photograph a diversity of skinks, which was a change from the geckos that I was used to seeing during the evening. Whilst staying close to Sepilok we decided to go on a night walk at the RDC as it was close by. Due to heavy rain a few nights in a row, we decided to put the walk off until we had no other choice but to do it. We ended up going for the walk on our final night in Borneo, which was typical as this was when I saw my first snake in Borneo. It was the Bornean keeled green pit viper (Tropidolaemus subannulatus), afterwards our spotters found more which made me wish I had done the walk sooner. 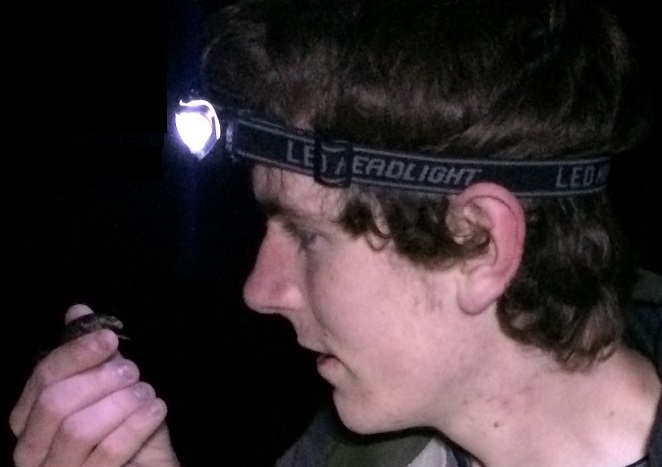 Other notable species seen on the night walk were flying squirrels (Petaurista petaurista) and colugos (Galeopterus variegatus). The island of Borneo did not disappoint me in its biodiversity and natural beauty. One alarming thing was seeing how much rainforest has been converted into palm oil plantations, which support the local communities. This alarming rate of deforestation may mean that we are losing species before someone like myself can visit and discover them. In the future I would love to return to Borneo, with the correct paperwork to study the frogs there. Just like when I visited Tanzania last summer, the memories I have taken away from this trip will stay with me forever. The photos I have taken will help me relive those memories at will in the future. About the Author: Steve is a zoology graduate from Anglia Ruskin University and the chairman of the Cambridgeshire and Peterborough Amphibian and Reptile Group (CPARG). Steve’s undergraduate project looked at the microhabitat preferences of great crested newts (Triturus cristatus), a species for which he has a fond passion. In his free time, he monitors a number of amphibian sites around Cambridge where his main goal is to map the distribution of the great crested newt. You can find Steve on Twitter here. Photo credits: All photos property of Steven Allain.